But even the most restless and demanding teens will enjoy these frugal activities. Your kids have most likely been protected from family information or just were bored or confused by your stories when they were younger. But now that they are teens, they are ready for greater honesty and more grown-up tales. Intrigue them with explanations of how grandma paid for college, why great-grandma got divorced, how family members lived during the Depression, what unpopular stances your parents took on controversial topics, and why a distant cousin ran away from home. Teens like working with adolescent companions, being inventive and competitive. A contest that is neither sponsored by the school nor graded by school officials is especially inspiring to this age group. The research, collaboration, and execution of ideas involved in winning a competition are great sources of entertainment for extended periods of time. Similarly, I envision teenagers happily and eagerly getting together to do science experiments, create engineering marvels, practice for mud runs, etc. in hopes of winning a competition. Not only is contest preparation a frugal activity, but this kind of entertainment could reap financial rewards as well as bragging rights. Arrange an outing that you enjoy and invite one of your child's friends. At first, the teen will probably not get excited when you mention hiking in the woods, camping at the lake, or picking berries on a farm. But if a teenage buddy or a colorful friend of the family accompanies you on the trip, then they may actually look forward to such activities. Many teens who are otherwise sullen and whiny on a family only trip often become polite and even fun people when they are around those who are not mom, dad, and sibling. Friends provide both a distraction from what the teens might consider boring and serve as entertainment through conversation, humorous insights, and funny stories. Shopping is entertainment for many people, including teens. But rather than seeing how much your teen can spend, set a budget and let her have fun putting together outfits for nearly nothing while perusing fashion apparel and accessories at discount stores, consignment shops, and thrift shops. Teenagers will go wherever the food is. Serve a meal outside on your patio or deck to get them out of their element. Take a picnic to a nearby park, careful to find a spot where friends or classmates are unlikely to appear. Linger to spot wildlife (we have squirrels, rabbits, and the occasional deer in our backyard), enjoy the view of a pond at the park, or watch the sunset. Catch a theater performance at one of the local high schools, colleges, universities, or community centers. Many of these are free or cost $5 or less, though it’s wise to check the ticket prices and suggested arrival times instead of making general assumptions. 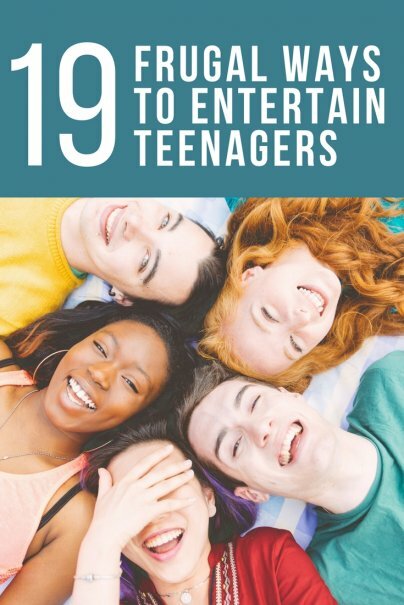 Plays can be frugal sources of entertainment for teens, especially if their friends are performing or helping stage the performance. Free or low-cost concerts are also often available at area schools and community gathering places. If friends of your teens are performing, they may like to see and hear the concert band, jazz band, orchestra, chorus, or choral groups. In addition, look for times when professional groups perform at low-cost venues, such as college campuses, street festivals, and community events. Go to a ballgame, track or swim meet, or other sporting event at the local high school or college. Most are priced reasonably, and some are free. Athletic competitions are often gathering places for teens, so they can enjoy being a spectator and hanging out with friends. For those who live in the country or suburbs, visiting a large city can be an adventure. Teens may like to do simple things that city dwellers find tedious, like ride the metro, commuter train, or light rail to the city center. They may enjoy just walking around, doing some window shopping, analyzing architecture, and sampling treats sold by street vendors. If you’re looking to entertain city kids, take them to the country. Many rural areas and small towns offer attractions that teens find entertaining even if they won’t admit to having fun. Plan ahead to make sure there is something to do. Look for outings to natural attractions like waterfalls and mountain vistas; quaint downtowns with full-service stores, fine art shops, and old-fashioned diners; and interesting historical sites. One of my son’s friends recently got a low-priced road bike to ride around town and in the mountains near his home. When students were asked to submit photos to the school newspaper to show what they did over spring break, he was featured smiling broadly with his bike and helmet next to photos showing teenagers in much pricier locales such as the Caribbean, ocean cruises, and amusement parks in Florida. Take teens on a spin on lightly traveled roads. If you don't want your teen on the road, visit mountain bike trails or multi-use trails. Another friend of my son’s is an aspiring filmmaker. I’ve seen him recording quirky teen activities (such as the aforementioned dodgeball tournament) and imagine that he spends much of his free time in this pursuit. Likewise, teens with strong visual or storytelling abilities will be entertained by capturing images on camera. I know that a lot of teens find anything that might involve learning to be painful. But some museums are so well designed that even boredom-prone teenagers may consider them entertaining. Newer and updated museums with lots of ways to interact (watching video, listening to audio, playing trivia games, touching stuff, etc.) as well as zoos, aquariums, and art galleries can be enjoyable. Many teens will eventually go to college and, though visiting campuses is most prominently featured on the parent’s to-do list, such a trip can be entertaining for adolescents. There are campus tours focusing on academics as well as those highlighting architecture. Plus, there is usually free or inexpensive entertainment, such as plays, concerts, and sporting events along with lectures and campus festivals. Creative teens are entertained by participating in artistic endeavors, particularly those not associated with academics or grades. They especially enjoy working with other teens, either on the same project or side by side (just like when they were younger). Challenge them to make art out of trash for a fun project. Teens can enjoy going to parks without being loiterers or worse. There are lots of fun and frugal activities for teenagers, such as renting canoes and paddleboats, swimming, playing tennis, or strolling in the rose garden. Add a bit of mystery to an otherwise dull activity — teens will love walking at night. Look at the stars and planets, planning evening outings in sync with astronomy events. Choose a safe, preferably out-of-the-way place. Be careful, carry a flashlight (or wear a headlamp), and wear reflective gear. Pick-up ball and similar spur-of-the-moment games were a mainstay of my childhood, but my children never wandered miles from home to an open lot to play with neighborhood kids. Such things just didn’t happen because well, kids rarely walk around neighborhoods unattended, and an open space without organized sports is rarely available. By the time they are teens, though, they should be fine playing pick-up basketball games or working out in public areas accompanied by friends. Most of the teens I know are involved in an organization that requires community service. Though many of these hours are spent fulfilling obligations, volunteering can be entertaining, particularly if the teen is pursuing an activity that he really enjoys, working alongside friends, and getting a free meal. My sons, for example, like the country ham biscuits at the church's yard sale and pizza at community recycling days. Beyond regularly scheduled volunteer activities are even more intriguing and engaging opportunities. For example, one of my sons enjoys hanging out with younger kids in the inner city and their adult teachers in a childcare setting, which syncs (partly) with his career goal of teaching at-risk high school students. A friend’s son loves serving at the animal shelter. Find meaningful volunteer gigs to entertain them while helping others. By the time they are 13, your children ought to be able to entertain themselves. But, sometimes, they can use a prod toward a healthy, wholesome, and frugal activity. What do the teens in your life do for cheap entertainment? I love that sharing family secrets is the first thing on here -- I'm past my teenage years, but my parents are still rolling out amazing stories that I've never heard. Having grown up in a rural area, I can definitely second "visit the city" too. In high school, I remember being entranced by even chain shops like Bath & Body Works, because they didn't have anything like that near where I lived. The interesting stories never stop! Sometimes, the parents may not realize that their teens didn't know something that was considered common knowledge. I think that storytelling and explanations are entertaining, and can help teens appreciate their family and their friends' families, instead of worrying about not have a perfect life. I like this post a lot and these are really cool ideas, I especially like getting them out of their element and serving food outside. Many young children go on picnics with families, but packing some yummy meals to bring to the park will allow some fresh air, as well as nice conversation. I think an interesting post might be "how to motivate your teenager" to do these kinds of things, as a lot of them these days would rather lay not he couch or surf the web. Thanks for your comment and the post idea of motivating teens. In general, though, I tried to pick things that teens would either want to do on their own or that you could easily get them to do. Most of the teens I know are motivated to do something, just not always what the parents want them to do. A friend of mine sent her daughter across the country for a four day stay at our house. My kids are all easy teens who are pretty easily entertained and did their best to make her feel at home: they tried a movie, the Wii (group video game), a board game... None of it worked. Then we had her signed up for a morning course of windsurfing (as we live by the seaside) but she has talked her way out of that too! To be honest, I don't know what to do with her and there are still two and a half days left. Any ideas?